Organizations need Security Champions to help foster security best practices to ensure a security-supportive culture. 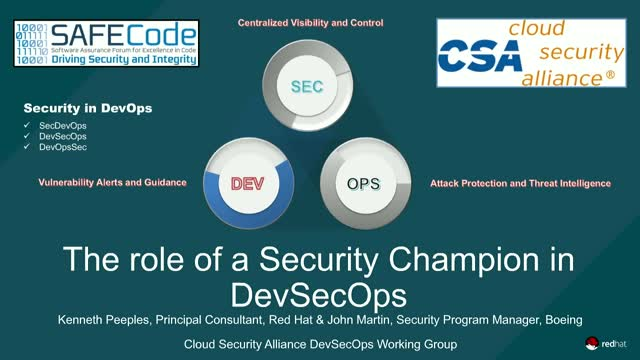 During this webinar the CSA/SAFECode DevSecOps Working Group wants to share how to build a group of security champions and the characteristics they possess. - How should an organization go about building a SC Program Strategy? Automation is key aspect of success in cloud adoption, it can help build faster and deliver continuously at scale. However, it can also make managing security a challenge it not planned well. A strong partnership between DevOps and security - focused on baseline safe configurations and hygiene - can lead to faster innovation and better security. - What if that infusion pump’s dosage was illegitimately changed or the pacemaker programming made malicious? - What if Brickerbot took out a surgical robot or a heart monitor at a critical time? - Why is it important to start with a secure hardware foundation for IoT products? - What hardware and software security features should you look for in a secure platform? - How is penetration testing an IoT product different from traditional IT systems? - What lessons can be learned from IoT product penetration testing? - What role can automated security analysis play in the product security lifecycle? - What can a product team do today to get them on the road to security-by-design? Exploring the latest research from CSA. Go in depth into CSA's latest research on everything from IoT to containers to blockchain. Webcasts will break down the research, provide use cases, instructions for implementation, and further insights.